The Chamberlin was an early pre-cursor of the modern digital sampler using a complex mechanism that stored analogue audio samples on strips of audio tape – 1 tape for each key. When a key on the keyboard was pressed the tape strip played forward and when released the play head returns to the beginning of the tape. The note had a limited length, eight seconds on most models. The instrument was designed as an ‘amusing’ novelty instruments for domestic use but later found favour with rock musicians in the sixties and seventies. Brass: Alto Sax, Tenor Sax, Trombone, Trumpet, French Horn, Do Wah Trombone, Slur Trombone and Muted Trumpet. Wind: flute, oboe, and bass clarinet. Voice: Male Voice (solo) and Female Voice (solo). Strings: 3 violins, Cello and Pizzicato violins. Plucked strings: Slur Guitar, Banjo, Steel Guitar, Harp solo, Harp Roll, Harp 7th Arpeggio (harp sounds were not available to the public), Guitar and Mandolin. Effects: Dixieland Band Phrases and Sound Effects. The Chamberlin was invented in the US in 1946 by Harry Chamberlin who had the idea (allegedly) when setting up his portable tape recorder to record himself playing his home organ. It is rumoured that it occured to him that if he could record the sound of a real instrument, he could make a keyboard instrument that could replay the sound of real instruments and thus the Chamberlin was born. Chamberlin’s idea was ‘simple’ – put a miniature tape playback unit underneath each key so that when a note was played, a tape of ‘real’ instruments would be played. At the time, the concept was totally unique. In the ’50s, at least 100 Chamberlins were produced and to promote his instrument, Harry teamed up with a guy called Bill Fransen who was (allegedly) Harry’s window cleaner. Fransen was (allegedly) totally fascinated by this unique invention and subsequently became Chamberlin’s main (and only) salesman. However, there were terrible reliability problems with the Chamberlin and it had a very high (it is said 40%) failure rate with the primitive tape mechanism which resulted in tapes getting mangled. Fransen felt that Chamberlin would never be able to fix these problems alone and so, unknown to Chamberlin (allegedly), Fransen brought some Chamberlins to the UK in the early ’60s to seek finance and a development partner. He showed the Chamberlin to a tape head manufacturer, Bradmatics, in the Midlands and the Bradley brothers (Frank, Leslie and Norman who owned Bradmatics) were (allegedly) very impressed with the invention and (allegedly) agreed to refine the design and produce them for Fransen but…Under the mistaken impression that the design was actually Fransen’s (allegedly)! A new company, Mellotronics, was set up in the UK to manufacture and market this innovative new instrument and work got underway with the Bradley brothers (allegedly) unaware that they were basically copying and ripping off someone else’s idea! Of course, it wasn’t long before Harry Chamberlin got to hear of this and he too went to the UK to meet with the Bradley brothers. After some acrimonious discussions, the two parties settled with Harry selling the technology to the Bradleys. Mellotronics continued to develop their ‘Mellotron’ whilst Harry returned to the US where he continued to make his Chamberlins with his son, Richard, in a small ‘factory’ behind his garage and later, a proper factory in Ontario, a small suburb in Los Angeles. In total, they made a little over 700 units right through until 1981. Harry died shortly afterwards. But whatever happened in those early meetings almost 40 years ago is inconsequential – the fact of the matter is that the two instruments are almost indistinguishable from each other. Each key has a playback head underneath it and each time a key is pressed, a length of tape passes over it that contains a recording of a ‘real’ instrument. The tape is of a finite length lasting about eight seconds and a spring returns it to its start position when the note is finished. As you can see from the photograph above though, the Chamberlin is smaller (although some mammoth dual-manual Chamberlins were also produced!). Many claim that the Chamberlin had a better sound – clearer and more ‘direct’ …. which is strange because the Mellotron was (allegedly) better engineered than the Chamberlin. But there is a lot of confusion between the two instruments not helped by the fact that some Chamberlin tapes were used on the Mellotron and vice versa…. so even though the two companies were in direct competition with each other, they shared their sounds….. weird! It also seems that some users were also confused and credited a ‘Mellotron’ on their records when in fact it might well have been a Chamberlin that they used (allegedly). However, given the similarities between the two, this confusion is understandable and it’s a tribute to Mellotronics’ marketing that they got the upper hand on the original design. To be honest, the whole story is shrouded in hearsay and music history mythology and we may never know the truth (especially now that the original people involved are sadly no longer with us) but regardless of this, the Bradley brothers were obviously more successful with their marketing of the idea than Chamberlin himself. 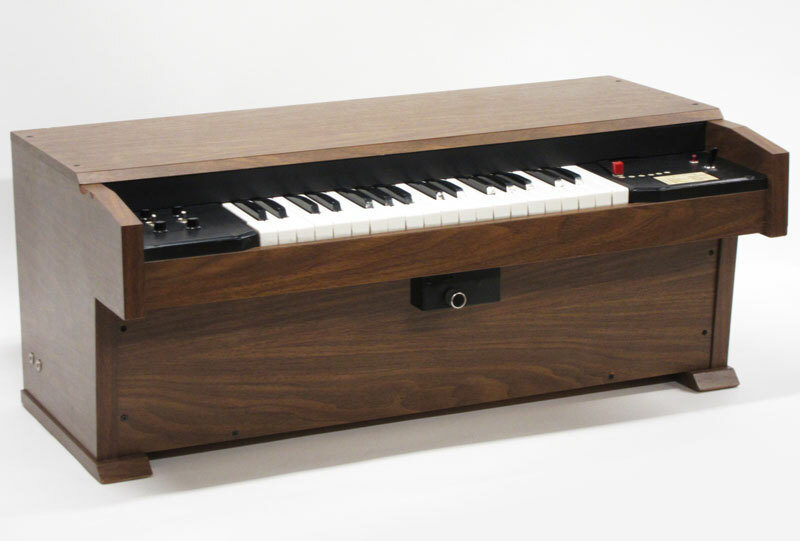 Although it was originally aimed at the home organ market with cheesy rhythm loops and silly sound effects, the Mellotron went on to become a legend in the history of modern music technology and the mere mention of its name can invoke dewy eyed nostalgia amongst some people. 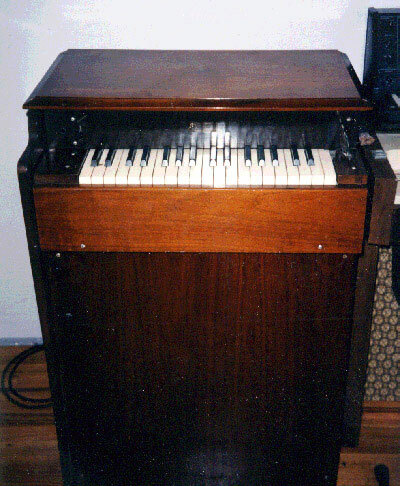 On the other hand, however, few people have even heard of the Chamberlin which is sad because Harry Chamberlin’s unique invention preceded the Mellotron by some fifteen years or more and by rights, it is the Chamberlin that deserves the title of “the world’s first sampler”. Nostalgia has a lovely Chamberlin string sound that captures the original Chamberlin character quite authentically. Unlike the original, though, the sound is looped but, like the original, it has the same keyboard range (G2-F5) and is not velocity sensitive. 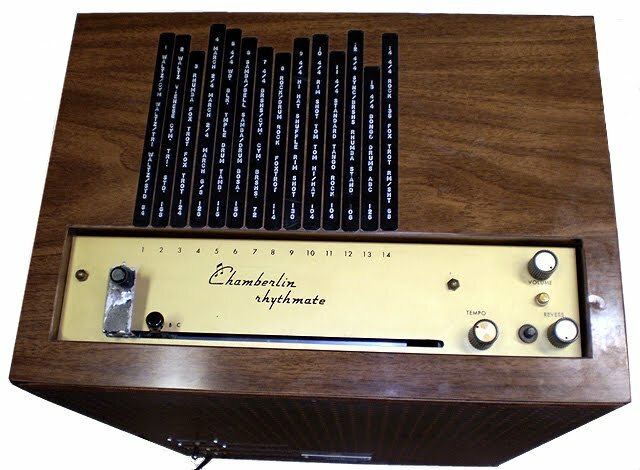 Created in 1949, The ‘ Rhythmate’ was one of the first electronic drum machines ever produced. The instrument was designed and built (probably only ten machines were ever produced) by Harry Chamberlin in Upland, California. With the success of the Chamberlin keyboards in the 1960s Harry Chamberlin updated the drum machine – the Rhythmate model25/35/45 produced from 1960-1969 with 100 models sold. The Rhythmate was a tape loop based drum machine designed to accompany an organ player. the instrument had 14 tape loops with a sliding head that allowed playback of different tracks on each piece of tape, or a blending between them. 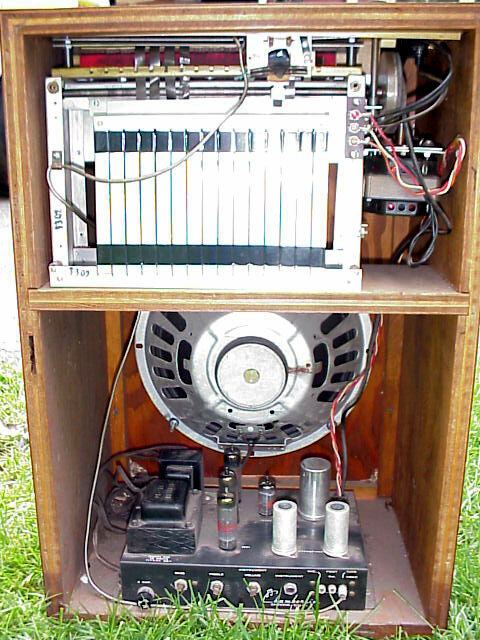 It contained a volume and a pitch/speed control and also had a separate amplifier with bass, treble, and volume controls, and an input jack for a guitar, microphone or other instrument. The tape loops were of real acoustic jazz drum kits playing different style beats, with some additions to tracks such as bongos, clave, castanets, etc. 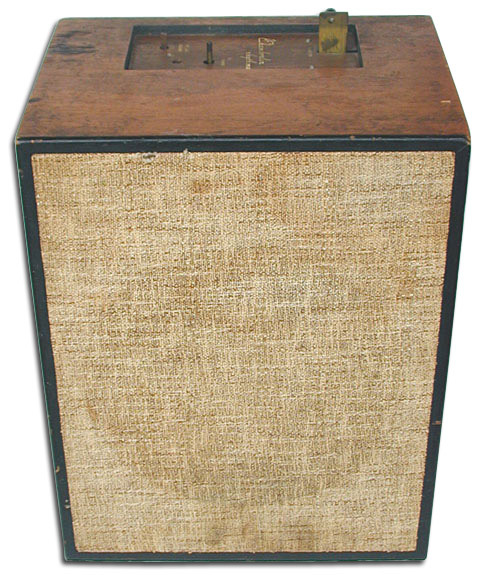 The Rhythmate has a built-in amplifier and 12″ speaker. In 1951, Harry Chamberlin used his idea of magnetic tape playback to create the Chamberlin Model 200 keyboard. The Model 300/350, 400, 500 and 600/660 models followed.